Finding camping in and around Los Angeles is always trickier than other places. Finding camping over Thanksgiving week — at the last minute — is nearly impossible. This is one of those exceptional times when our “no reservations” policy has made life more difficult. We’ve looked around the past couple of days and found that our choices have dwindled to virtually none. Normally we’d bail out of the metro area and head a hundred miles into the desert where other people don’t go, but this week we have special considerations. We need to be back to LAX on Saturday, and we have friends to meet in the area, and I want to get some work done before we fly out. Plus, Eleanor wants to do some cooking even if we aren’t going to have a full-blown Thanksgiving dinner in the trailer this week. That means we need the impossible: a camp site that is inexpensive, close to Los Angeles, and offering full hookups. In reality we can get any two of those three things this week. 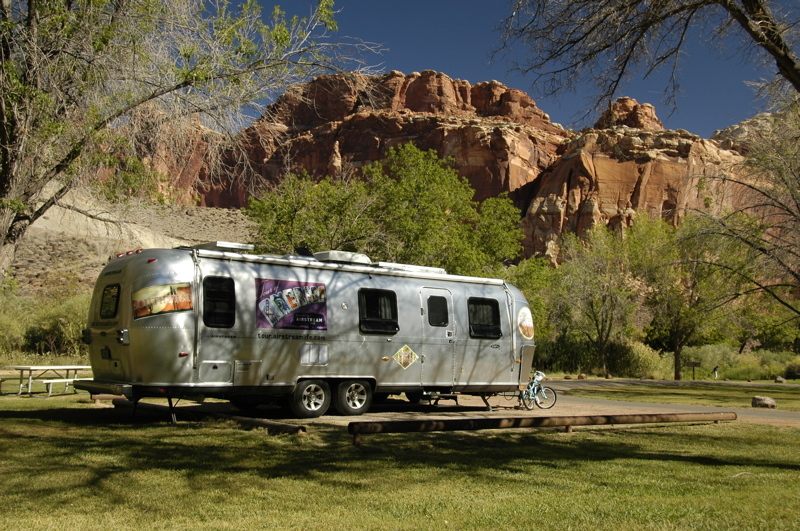 The reason is that area campgrounds are charging “holiday rates” for sites. Here that means $55 per night for a site that should cost about $30 normally. The more reasonably priced state parks are booked solid. We have a potential strategy to try to get into a county park that doesn’t take reservations, but it is boondocking only (no water, electric, or dump station). So we decided to spend one night in an overpriced full-service campground so we could dump, refill, do laundry, and stay closer to our Ventura friends. Fully restocked with water and with empty holding tanks, we’ll be ready to hit the county park on Tuesday, assuming we can get an opening. The place we have ended up is actually very well-kept and would be a decent place if it were not located directly adjacent to Highway 101. Pick any major interstate highway and imagine yourself camped in the breakdown lane, and you won’t be too far from what it is like to be here. By day the noise is tremendous, a constant four-lane roar layered with thundering tractor-trailers, the whine of tires on concrete, and the occasional unmuffled motorcycle. There is no chance of sitting peacefully under your awning in the afternoon, unless you are stone deaf. This is not what Gerry Beckley and Dewey Bunnell had in mind when they wrote their lyrics. “There are a lot of transients in this area,” warned the nice lady at the check-in counter. They asked me to destroy the secret code to the bathrooms and the pool somewhere off-site, so a dumpster-diver can’t find it. Propane refills are $4.50 per gallon, and you have to leave your driver’s license while the tank is being refilled. And yet the place is sold out for Thanksgiving, at $55 bucks a night. When I see situations like this, I wonder “Who in their right mind would choose to stay here and pay that rate to park in the noise? Can’t they think of a better place to be on a holiday?” For us, this is like torture. I’d rather be at a Wal-Mart. The noise makes me feel like we are staying at the Flying J truck stop, only with grass. I’ve never understood why people will voluntarily park for more than a night in a noisy RV park. But even in the rattiest hell-holes of RV parks I have met people who think they are in paradise, so clearly there is something I’m not seeing. It is probably that, like us, they have a particular reason to be here (relatives?) and are simply taking what is available. It certainly is true that along this stretch of coastal California there are hardly any places to camp away from Hwy 101, so perhaps they figure that at least in the RV park they get hookups with their dose of noise. In other parts of the country we have bypassed such places and found a lovely county or state park just a few miles away. I know most of these folks have a copy of Woodall’s guide or the Trailer Life directory, so they must know that other options exist. For some reason, they won’t take them. Well, perhaps tomorrow we will. Up the highway the county parks we have our eyes on probably won’t be a lot quieter because they’ll be near Hwy 101 too. There won’t be any hookups at all and we’ll have to conserve water and electricity as we have done so many times before. But for those considerations (plus $20 a night) we will be just a hundred feet from the pounding Pacific surf, and we’ll have a million-dollar view. I’ll take that deal — if I can get it. If not, we’ll have to figure out Plan B. 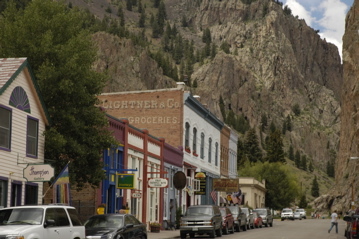 First official day of the rally has been mostly nice … Creede is an interesting old mining town with a historic downtown butted up again towering rock walls. We took Rich C into town and did some exploring. 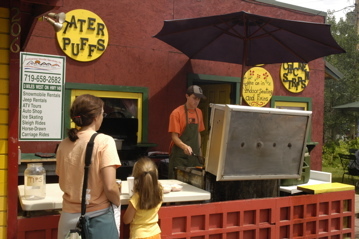 There’s a lot for such a small community: a historical society, a museum, hotel, general store, “self-service B&B”, a dozen or more shops, a lot of rental cottages, and “the best doghouse in Creede.” We went to the dog house and got some bratwursts for lunch. 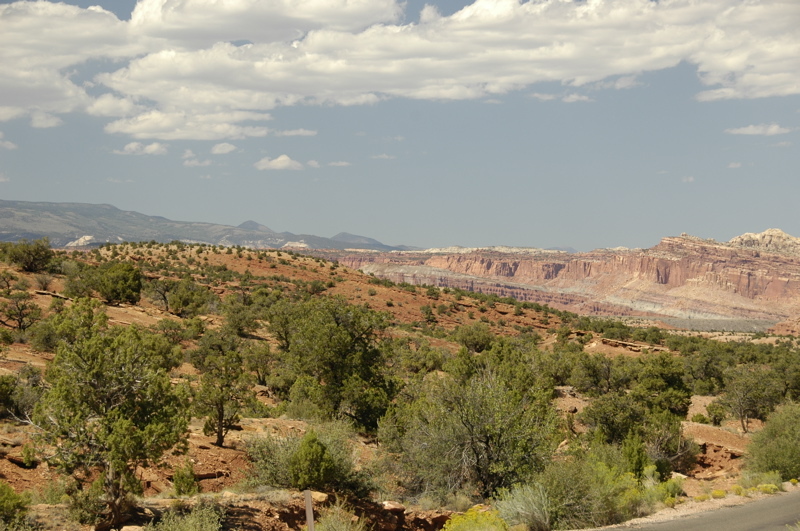 From downtown you can drive a few miles up into the former mining country and see abandoned mines everywhere. We were told the rockhounding was good, so we took the drive. In 15 minutes of hunting we found some colorful stones and a lot of rocks flecked with iron pyrite (Fool’s Gold). Eleanor and Emma are planning to head up again tomorrow to do some real searching. Emma wants to find a piece of fluorite. The road makes a grand circle up into the mountains to well over 10,000 feet, and then winds down with views of Creede and our campground. It’s a shame that the evening had to end on a bad note. When we returned to our campsite, after dark, we found our new friends and next-door neighbors pulling their vintage Airstream out of their campsite. They had only arrived this morning. I was told that the campground management was rude to the mother over some minor issue, and their 13-year-old daughter spoke back, saying “You can’t speak to my mother like that.” The management, unable to deal with a 13-year-old, evicted them on the spot. We’ve been here only one day and it has become obvious that this campground is not family-friendly. Every child attending the rally except Emma has had a run-in with the management. The campground is busy selling long-term leases for campsites (reportedly for $60k!) and apparently would prefer that children not be part of the scenery. The transition to leased campsites is not attractive anyway. Rich C was bitched at by some busybody “owner” (lessee) for pulling up in the wrong spot while registering for his site. I (and several other people) got lectured for using a “private” walkway alongside the campsites. Some of the people who are buying lots here have crossed the line from happy campers to possessive fools. If that’s what “campsite ownership” turns people into, I’ll never do it. Our other Airstream neighbors are leaving tomorrow — three days early. Even though they don’t have kids, they no longer feel comfortable staying here. I am wondering if we’ll be next. We would hate to leave the rally, but ethically we are caught between supporting our friends who put a lot of effort into organizing the rally, and disagreeing with the policies of the campground management. 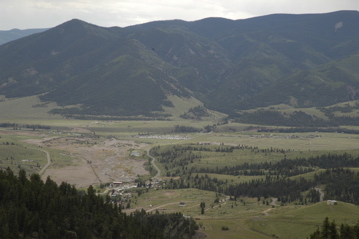 One thing is certain, I cannot recommend the Mountain Views RV Park in Creede Colorado to anyone with children, and if you don’t have children, be sure not to set foot on an “owner’s” campsite. OK, there’s one really good reason why people don’t make the 20-mile drive from Jackson, WY to much cheaper campgrounds in Victor, ID: the Teton Pass. Rich C went over first, yesterday afternoon. He came down trembling, and called us to warn us. The pass is a monster — easily the worst one we’ve seen yet. 10% grade up and down, with lots of twists. In the winter, it’s basically impassable many times due to heavy snow (it tops out around 8500 feet). It did turn out to be an interesting test of the Nissan Titan/Armada. Rich C has the Titan, we have the Armada. Both are identical engines, transmissions, and nearly identical towing capacities. But Rich C has an advantage going up: his trailer weighs about 6500 lbs loaded and ours weighs about 8000 lbs loaded. So he got up in second gear, occasionally slowing to 25 MPH. That wasn’t bad because the speed limit was 25 most of the way. We had more difficulty. The engine got hot about halfway up and we had to climb in 1st gear to keep it under control. Thanks to keeping the engine revolutions high (over 3,000 RPM), the transmission never got hot, but about 2.5 miles from the top, we were forced to pull over and rev the engine in neutral to let it cool. It was 87 degrees when we did this, so we also pulled out some of our other tricks, including turning off the A/C and turning on the heat, full blast. This is the first time in 25,000 miles of towing that we’ve needed to go to such extremes. 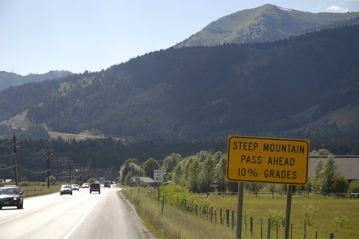 Rich C stated what we all felt: “There’s NO WAY I’m going over that pass again with the trailer!” We’ll use a lower pass about an hour south of Victor to get to Colorado, when we go. The campground and the little town of Victor are nice, in a western style. We’re all loving the dry climate and beautiful weather. Emma and I spent the early evening in the pool diving for sticks, and just relaxing. However, there’s no Internet in Victor. Sprint doesn’t cover the area. The campground wi-fi, predictably, doesn’t work. So today we all drove over the pass again (without trailers!) to Jackson and I settled in here at the local cybercafe/tattoo shop/jazz cafe to get a day’s work done. We may stay another night or two to get caught up on things, then we’ll head into Colorado for more adventures. I’m still catching up with blog entries and photos too, so look for more backfilled stuff as I get time. We arrived at the Bolsa Chica State Beach campground before 8:30 this morning, but they have a policy of allowing no “check in’s” before 2 pm. So we bought a site and parked the trailer in the Day Use area, while I headed off to Costa Mesa and Chino Hills to meet some Airstream people (research for future articles). When I got back at 4 pm, I hitched the trailer back up and towed it into the parking space — er, I mean “campsite”. None of us are wild about this spot. The beach here at Bolsa Chica is long and broad, but also flat and featureless. The high surf and cold water meant frolicking at the beach was not much fun (despite daytime temps in the upper 60s), and the campsite is so close to the Pacific Coast Highway that the roar of cars is nearly constant. 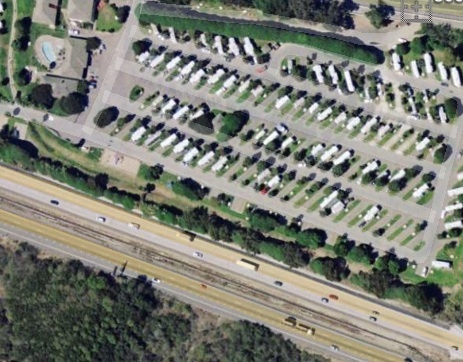 Campsites here are really just parking spots on asphalt, delineated by painted white lines. There are no trees. All this for $39 — the most expensive site we’ve purchased to date. We’ll be outta here tomorrow morning, in search of a better place somewhere down the coast.